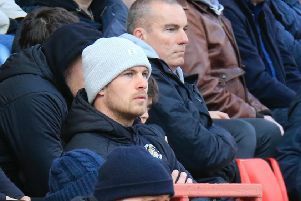 Luton got back to winning ways at the weekend with a 2-0 win over Barnet in front of the Sky cameras at Kenilworth Road. Here’s how the Town players rated on the day. James Shea: 7.5 - League debut for the Hatters after a lengthy wait and didn’t let anyone down at all. Off his line quickly to clear from Akinde, caught well and then made a fine stop at the end to ensure Town kept a first clean sheet since early February. James Justin: 7.5 - Finally given his chance at right back after Stacey dropped to the bench and can be happy with his performance. Kept things solid, while still breaking forward to send over some dangerous crosses from the flank. Dan Potts: 7.5 - Becoming almost unplayable from set-pieces these days as went close inside a minute and won a number in the air again as Barnet couldn’t cope. Peeled away for Town’s opener, doing superbly to twist his body and cushion a header back for Hylton to net. Scott Cuthbert: 8 - His return from injury has led to Town looking far more dominant defensively in the last few weeks and he was back at it again on Saturday. Often made sure he was in the right place to get his head on things when the Bees went long. Alan Sheehan: 8 - Perfect way to mark his 100th appearance for the club as Town weren’t breached for the first time in seven games. Never allowed Akinde to settle and his excellent free kick set up Luton’s pressure relieving opener. Olly Lee: 7.5 - Another who grew into the game in the second period as he started to get on the ball and look to dazzle his opponents with some neat footwork. Always a threat from range, whistling one volley over and another blast tipped over. Luke Berry: 7.5 - Always eager to get his shots off when he spied an opening and doesn’t often miss the target either. Forced Ross into two saves, one comfortable, the other less so from a 20-yarder. Andrew Shinnie: 7.5 - Back in the side with Luton at home again and he helped knit Town’s attacking play together. One effort was crucially blocked as Luton went through the gears after the break. Danny Hylton: 7.5 - Confidence visibly lifted after turning in Potts’ header to end his mini drought in front of goal. Helped Town stay on the front foot by winning a number of free kicks as he gave the Barnet defence plenty to think about. James Collins: 7.5 - Wonderful touch to bring down Berry’s pass and took his shot early which helped deceive Ross for this 19th of the season. Looking lively and full of goals at the moment, hitting real form just at the right time. Glen Rea (SUB) 6 - Slotted in well in the closing stages, cleaning up a few attacks. Jake Jervis (SUB): 6 - Few little party tricks to keep hold of possession. Jack Stacey (SUB): N/A - Ran on and that was it.